The Orthopaedic Department of Babcock University Teaching Hospital just achieved a great feat, as it performed its first successful spinal surgery. 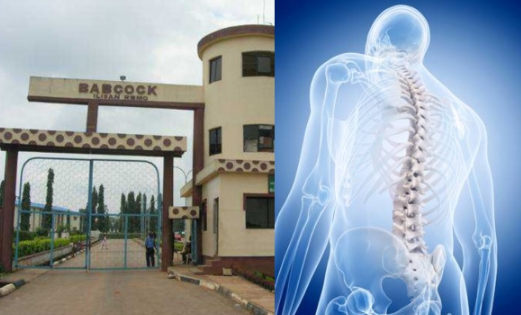 Kelechukwu Onuoha, Consultant Orthopaedic and Trauma Surgeon with Babcock University Teaching Hospital, BUTH, who confirmed the successful spinal surgery, said it was carried out under general anaesthesia. The patient was a middle-aged female with multi-level “spinal stenosis”. Spinal stenosis is a narrowing of the spaces within the spine, which can put pressure on the nerves that travel through the spine. The condition occurs most often in the lower back and the neck. Some people with spinal stenosis may not have symptoms. According to Dr. Kelechukwu, the procedure uwas a revision spinal surgery L2 – L5 lumber spinal decompression and instrumentation. "The 59-years-old patient, who asked for protection of her identity, had undergone a spinal surgery five years earlier in another hospital,” he said.